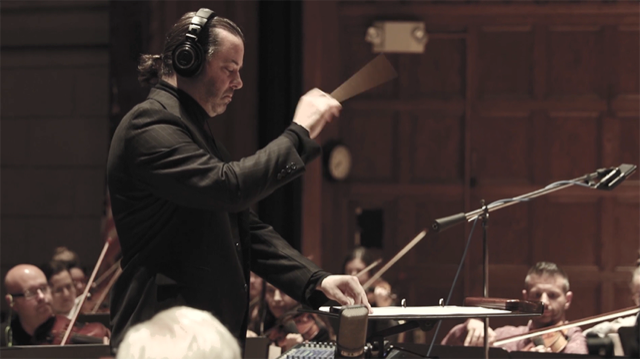 Being able to commission original music for a project and then having it recorded by a 50-piece orchestra is a real luxury. So when the opportunity arose, whist working on a TV ad for a client based in the Middle East, we pulled out all the stops to ensure that what we ended up with was perfect for the product, client and their audience. Our client was developing an online tendering service, that when introduced to the public would make the administrative side of doing business much quicker – the old system being paper-based, slow and antiquated. So the music had to reflect this, enhance the narrative and engage the audience. It was important that we found a composer who understood all this and in approaching Australian born Aaron Kenny, now based in New York, we knew we’d found the right person for the job. Aaron’s body of work speaks for itself. He produces award-winning work for the concert hall, stage and screen as well as this particular type of commercial work for brands. Working from an animatic we had developed for the TV ad, Aaron began to compose the score. As the project progressed, so too did the music. As we developed an offline edit for the ad, Aaron had the chance to fine tune the composition, working closely with the River Film production team. Once Aaron had completed the piece, titled Bureaucratic Waltz, it was our task to find an orchestra and conductor who could do the work justice. 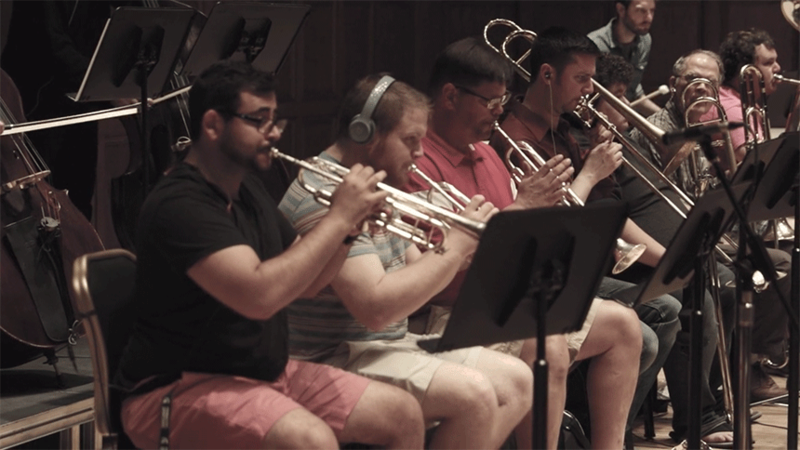 We engaged the Youngstown Scoring Stage, a 50-piece orchestra, based in Ohio, to perform and record the composition. Led by their director and conductor, Todd Maki and with Aaron present via a live video link, Youngstown performed fantastically and the recording was a great triumph. As a bespoke piece of music Bureaucratic Waltz works really well for a number of reasons. Aaron employed several musical devices that have specific relevance to the product and its audience. Ok, a waltz is a very ‘un-middle eastern’ musical form. This kind of orchestral waltz is more in keeping with classical, romantic salon, ball music associated with Vienna especially Johann Strauss. However, the opening, which is in a minor key, has a certain tension created by the juxtaposition of the more eastern sounding cor anglais playing a theme against it. The cor anglais is a similar instrument to the oboe but has a deeper darker tone. Throughout the opening section the lightheartedness implied by the waltz form is dominated by a ponderous almost ominous slow march created by the timpani, basses and cellos played on the strong beat of each measure of 3. This clearly represents how the old tendering system was such a struggle to work within – yet people had to persevere. At 1:02 the theme originally stated by the cor anglais is reintroduced this time on the trombone. There is excessive use of the slide which has a lazy feel and, for the first time, evokes an element of humour. Although the piece remains in a minor key, high strings are now used to ‘answer’ the slippery phrases created by the trombone. The orchestration, originally quite thin, becomes more intricate creating more texture and a busier more bustling background against the meandering drunken trombone. Soon the strings take over, restoring a sense of order and creating a tonal transition from the darker previous section. The bustling violin adds an increased sense of energy and purpose brushing the lazy theme, previously played by the trombone, aside and suggesting a change of direction whilst still maintaining a sense of tension. This change in direction follows our narrative as, in the ad, the new system is unveiled and begins to work. As the theme continues to change, further transitions are made in the strings and the theme is finished off, this time more precisely by a trumpet. At 1:49 the theme is restated by the strings, but this time in a major key releasing tension built in earlier sections and ending in triumphant brass fanfare – the new online tendering system, put into place by our client, has come into full effect and is a success. 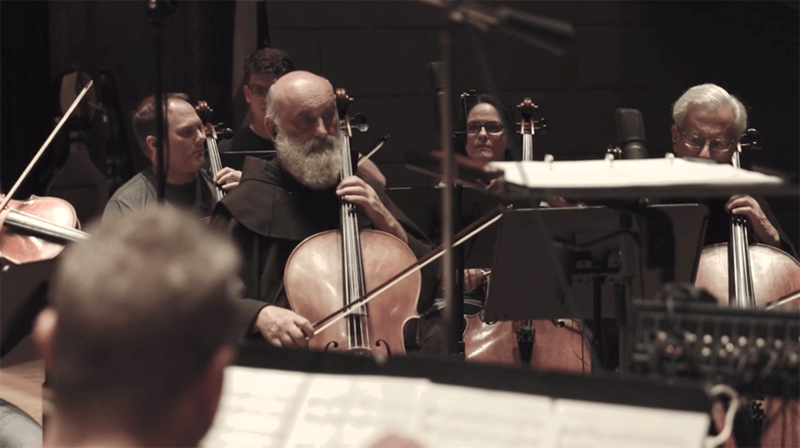 Only by commissioning original score can you achieve such a close and dynamic relationship between the music and the moving images, but there are ways around employing an orchestra to perform and record it. For us, the most common scenario is to have a piece of music written for a project and then for it to be produced digitally. In a sense, this way of working offers the best of both worlds – our clients get a bespoke piece of music, but the cost is relatively low. As the production values and sophistication of digital music production are now so high, the results are often breathtaking. That said, compositions that have been given the human touch are still preferred, as this gives the music a much better “feel”. One way of achieving this and still keeping costs down is to use original music, produced digitally, but then bring live instruments into the mix. This humanises the music and enhances the timbre and dynamics. Stock music, that has been sourced from a library, also has its place. The problem being, it can take an inordinate amount of time to find just what you’re looking for – along with music that is unsuitable, there’s also a lot of badly produced or bland pieces to sift through. No matter how or where we source the music for any given project, however, the journey always begins with the brand. First and foremost, the music needs to reflect the values of the brand and engage the brands audience – not just reflect the personal tastes of those involved in the project. The Bureaucratic Waltz, once finished, ticked all the right boxes and the client and our team were delighted with the outcome that we’d worked so hard to secure.